heartofoshun wrote a very early Silmarillion-setting story I liked. It's called We Weren't Born to Follow, about the Tatyar, the not-yet-Noldor deciding under the stars whether to follow Finwë and journey West to Aman. 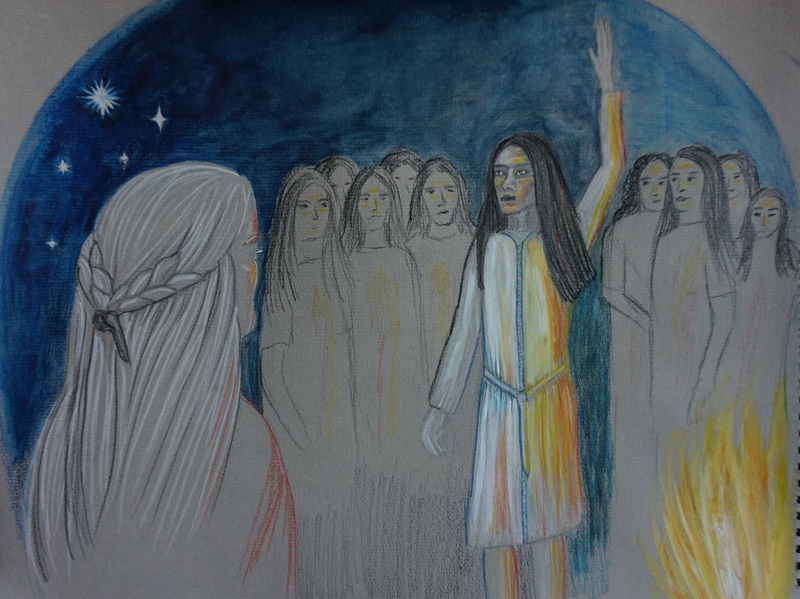 I loved the image of Míriel under starlight and the Noldor watching Finwë speak, his eyes full of light, everything colored by starlight and firelight, so I tried to draw it. As usual it looked better in my head than on the paper, and better on the paper than as a photo, and better as a large photo than a small one... but there you go, that's the internet for you. It seems to me you really captured the atmosphere of the story--Finwe's enthusiasm and how Miriel's attention focuses on him. I am so excited. The picture has a great central focus. Oh, wow! That is terrific! I am thrilled that my little story inspired you. I love the colors and the shades of light. I think you handled it really well! The stars are quite beautiful too. Lovely shapes. I also really like Miriel's hair. Can tell people about it and link back to here? Or did you put it anywhere else like Deviantart or Tumblr? I'm so pleased you like it. I like Miriel's hair too: that bit came out just as I imagined it! I forgot to say that another detail I liked from your story was Finwë's strange clothing from Valinor: I thought that would catch the light differently to the clothes of the others. I think it is beautiful "as-is." But I can totally understand to impulse to want to fiddle a little before declaring it the finished version. I do that all the time. That is a problem with me and fic swaps. I might finish a story before a deadline, but not want to publish it right away! I really like the use of the light pencils here to create luminous areas. In the photo at least, your picture looks very medieval - the shapes of people, their expressions, Finwe's hands, the composition etc. The coloring is not so medieval, though.